The Board of Directors (BOD) is the legal representative of The Lutheran Church—Missouri Synod. It is the custodian of all the property of the Synod — directly or by its delegation of such authority to an agency of the Synod. The BOD exercises supervision over all the property and business affairs of the Synod, except in those areas where it has delegated such authority to an agency of the Synod or where the voting members of the Synod, through the adoption of bylaws or by other convention action, have assigned specific areas of responsibility to separate corporate or trust entities. In such circumstances, the BOD retains general oversight responsibility as defined in Synod Bylaws. The Board of Directors met August 24–25, 2018, in St. Louis, hearing reports from the Rev. Robert Zagore, the new Executive Director of the Office of National Mission, and from the Rev. Dr. Daniel Harmelink, Executive Director of Concordia Historical Institute, Synod’s Department of Archives and History. With the 2017-2018 Fiscal Year (FY2018) having concluded on June 30, the board reviewed preliminary year-end financial statements, which indicated a small loss but also a reduction in the accumulated unrestricted, undesignated net asset deficit from $13.6M at the end of FY2017 to $13.3M at the end of FY2018. Measures taken by the board and staff to begin reducing the unrestricted, undesignated net asset deficit are beginning to bear fruit. (Temporarily and permanently restricted assets increased by $8.15M and $1.45M, respectively.) International Mission, National Mission, and KFUO expenditures (while under budget) exceeded designated monies raised by $1.64M, $394k, and $169k, respectively, these gaps being closed with undesignated gifts that are capable of flowing where most needed. All in all, Synod’s FY2018 concluded far better than the year before. Chief Administrative Officer Frank Simek presented the results of a thoroughgoing Information Technology assessment and reorganization, designed to improve performance and efficiency by leveraging synergies with Concordia Plan Services and outside expertise. The plan will result in an annual cost savings to Synod, after the first year, of $667k, with additional savings to Concordia Plan Services. 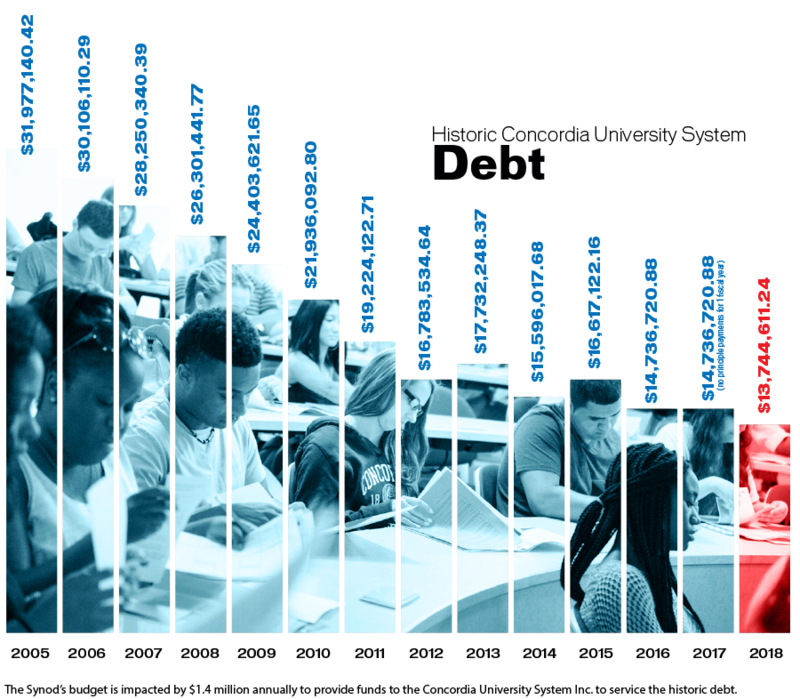 Simek also presented on an International Center facilities management assessment and reorganization, anticipated to save corporate Synod, Concordia Plans, and the LCMS Foundation a total of $64–112k savings annually. The board also accepted an assessment of its accounting functions, performed by an outside consultant, and directed development of implementation plans. Chairman Kumm noted that efforts of the past three years to work intentionally with the synodwide entities and to take stock of every area of Synod’s business operations are beginning to bear significant fruit. In other items, the board reviewed a variety of property transaction requests, forwarded an overture to the 2019 convention to protect delegate personal information, adopted budget guidance to continue to address the undesignated / unrestricted net asset deficit, and made or approved a variety of appointments (including an appointment of the Rev. Josemon Hoem to a vacant at-large ordained position in its own membership). The board next meets November 15–16, in San Diego, in conjunction with the LCEF Fall Conference. Minutes of previous meetings are available upon request by contacting the LCMS Chief Administrative Office. The Handbook of The Lutheran Church—Missouri Synod includes the Constitution, Bylaws, and Articles of Incorporation of the organization. The 2016 Handbook of the Synod has been published electronically as of Feb. 1, 2017, as the “February 2017” edition. It includes a completely redesigned index, is available in Adobe PDF and Microsoft Word versions, and is accompanied by a “red-lined” edition, indicating the changes made since the 2013 Handbook. The print edition of the 2016 Handbook has been delayed so that it can accommodate certain changes required to be made by the convention in a process that is yet ongoing (see the Preface). In addition, the Commission on Handbook periodically incorporates minor corrections and other non-substantive changes as part of its responsibility for the ongoing maintenance and management of the Handbook. Please report suggestions for correction or improvement, particularly regarding the new index, to the Office of the Secretary. The Board serves to provide leadership in achieving the objectives of The Lutheran Church—Missouri Synod as stated in Article III of its Constitution and Bylaws so that Christ’s name may be glorified among all people throughout the world by serving each other in Christ’s name, reaching our communities with Christ’s love and claiming the world for Christ’s kingdom. The criteria for membership on the Board of Directors is outlined in the LCMS Handbook (Bylaw 3.3.4.1). As our churches and schools come under increased scrutiny, the LCMS is dedicated to helping pastors, church workers, church administrators, lay leaders and others learn how to better protect their church or school from potential legal challenges. From time to time The Lutheran Church—Missouri Synod joins amicus briefs for Supreme Court cases in which the outcome is likely to affect the church. Browse a listing of briefs to which the LCMS has joined. In most cases, the text of the entire brief is available.